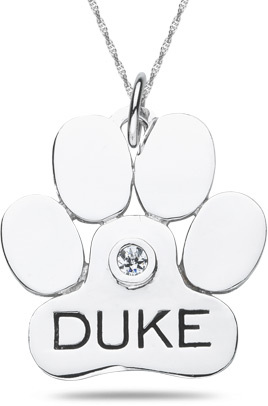 Personalize this adorable and unique dog paw pendant with your dog's name and select from either a genuine white diamond, genuine gemstone, or synthetic diamond. Choice of 10K or 14K White or Yellow Gold. Matching 18" Singapore Chain included. We guarantee our Personalized Dog Paw Pendant in 10K or 14K White Gold to be high quality, authentic jewelry, as described above.